Today’s million dollar question: how many types of gnocchi are there? What’s that? Speak a little louder. Oh, just the potato one? Hmm not quite right. Turns out there’s three. You’ve got Gnocchi Romaine (made from semolina), Gnocchi Parisienne (made from choux pastry) and the aforementioned ‘potato one’ – Gnocchi Piedmontaise. I’ve made the former and latter and could ramble on for a while about the various ins and outs of each one, but a) that would probably send you to sleepy land and b) I want to talk about something else. That something else being this Spinach and Ricotta Gnocchi. I know what you’re going to ask. Please don’t. I haven’t the faintest clue what ‘category’ it fits into. Does the ‘yummy type’ count? Who wants some light, herby morsels in their tummy? They’re tossed in browned butter and toasted pine nuts too. Now we’re really talking. Pair them with a fresh salad or lightly steamed veg from the local farmers market and you’ve got a delightful summery meal. Is it cold and wintery where you are? Roast up a load of root veg, increase the browned butter sauce and be generous with your parmesan garnish. Total warm your bones material. 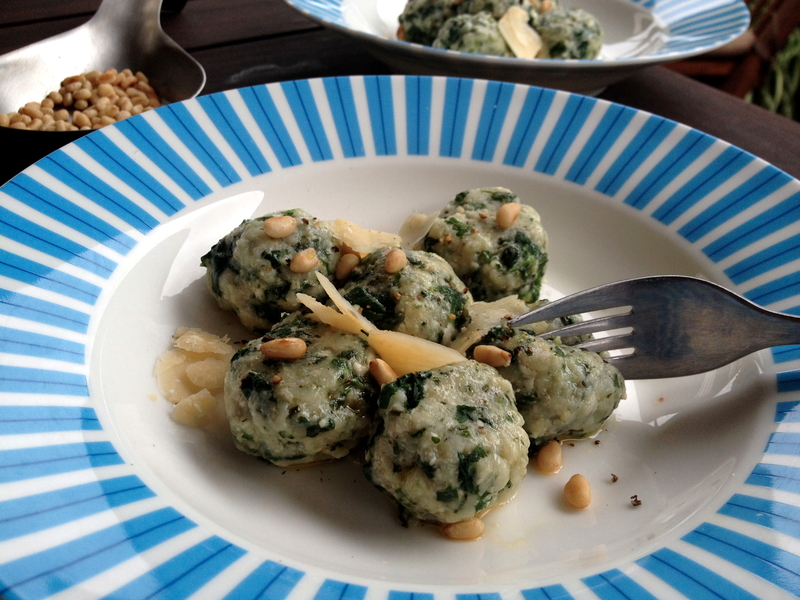 The two main ingredients in this gnocchi are…..spinach and ricotta. Duh. Why did I even ask? A little flour and egg is necessary to bind it all together. Prepare the mixture up to a day ahead and refrigerate – it makes for very easy preparation come tea-time. Pop open a bottle of wine and you’re laughing. Let’s get one thing straight though, like it’s other gnocchi cousins this ain’t a dish to be messed with. Unless you want stodgy, gummy bullets you’ve gotta give it some respect. Now, wringing the living daylights out of your wilted spinach might not seem very respectful, but trust me, this gnocchi is a bit perverted. It likes it. The more liquid you squeeze out, the lighter and fluffier your gnocchi will be. Yes, these babies are cooked in water but a sloppy dough is a baaad sign. Moist is good. Sloppy, not so much. Handle the mixture lightly – mix the ingredients together gently to avoid overworking the gluten and pushing out all the air. Roll into tablespoon sized balls. Softly, softly. There we go. Give it some love. From there it’s into the fridge and then sliiiiide them (that’s a slow slide, by the way) into a pot of boiling salted water. Where’s that wine? Brown your butter at the same time – if you’re a brown butter virgin, never fear, the details are in the recipe below. Out of the water, a quick pat dry and into the frying pan they go. Ta da! You’ve just made gnocchi. The scrummy kind. 20g fresh herbs, finely chopped. 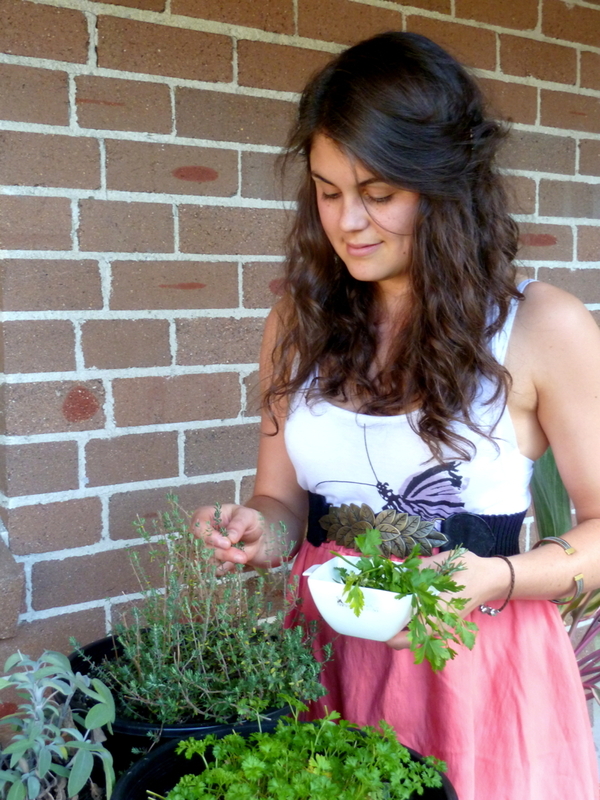 Parsley, basil, thyme & rosemary work well. Rinse the spinach under cold water and gently shake off the excess droplets. Place a frying pan over medium heat. When hot, add the spinach and sauté for approximately 1 minute or until wilted. Remove from the pan and set aside to cool. Meanwhile, bring a small pot of water to the boil and add the unpeeled garlic cloves. Cook for four minutes, remove the cloves, peel and put through a garlic crusher. Use a fork to mix the crushed garlic with the finely chopped herbs and lemon zest. In a medium sized bowl beat the herby-garlic mixture into the ricotta. Season with salt and pepper and beat in the egg yolk. Squeeze as much water as possible out of the spinach – really wring it – and finely chop. Stir though the ricotta mixture until well combined. Now gently stir though the parmesan cheese and sifted flour until the flour is just incorporated. The mixture should be moist but not gluggy. Take scant tablespoonful’s of the mixture and gently shape into balls using the palm of your hands. Place on a baking tray or large plate. Repeat until all the mixture is used, leaving a small space between each ball – you don’t want them to stick together. Refrigerate for at least thirty minutes, and up to a day. Bring a large pot of salted water to a rolling boil. Gently lower the balls into the water. Cook for approximately 4 minutes or until the balls rise to the surface. While the gnocchi are cooking brown your butter. Pop the butter into a frying pan (large enough to fit the gnocchi) and set over a medium heat. Leave to melt until the butter stars to ‘pop’ and turns a light amber colour. Remove the pan from the heat. Once the gnocchi are cooked, use a slotted spoon to transfer them to the frying pan containing browned butter. Toss gently to coat. Serve immediately, topped with a scattering of pine nuts, a good grind of black pepper and sea salt and shaved parmesan cheese. Source: Adapted from The Classic Italian Cooking Course by Jeni Wright & Angela Boggiano.